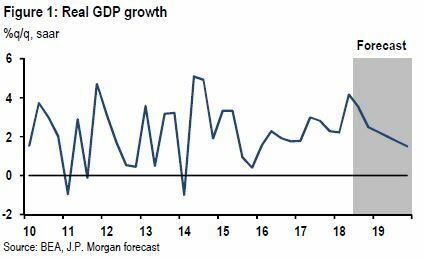 JP Morgan economists expect economic growth to slow down in 2019, to a pace of 1.9 percent for the year. The economist say the slow down from a “boomy” 3.1 percent in year-over-year fourth quarter growth will come as fiscal, monetary and trade policy get less supportive or more restrictive. But even with slower growth, wages will continue to rise as the labor market tightens. “We see the Fed needing to exert modest restraint on growth, hiking four times to 3.25 to 3.50 by year-end,” said the economists. The Fed’s current forecast is for three interest rate hikes next year, and one more this year, in December. Boosted by tax cuts and stimulus, the economy’s growth picked up to a peak of 4.2 percent in the second quarter, 2018 and was growing at 2.5 percent in the fourth quarter, according to JP Morgan’s forecast. The economists said monetary policy, supporting growth for a decade, will move closer to a neutral position, and fiscal policy will be supportive in 2019 but less than in 2018. “Trade policy thus far has been only a minor nuisance, but we expect that tariffs will become a more noticeable drag on growth in 2019,” they wrote.